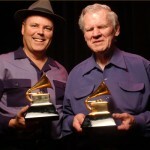 Picture shows Dave and Doc Watson receive Grammy for "Legacy"
Regular partner of Doc Watson. He will be performing at the 2011 Cape Clear Storytelling festival 2nd-4th September and will do just two intimate concerts in Ireland before heading home. Four-time Grammy Award winner David is a musician, storyteller, historian, television host and entertainer, dedicated to performing and preserving traditional American music and stories. Holt plays ten acoustic instruments and has released numerous award winning recordings of traditional mountain music and southern folktales. Has performed and recorded with many of his mentors including Doc Watson, Grandpa Jones, Bill Monroe, Earl Scruggs, Roy Acuff and Chet Atkins. Today he tours the country performing solo, with Doc Watson and with his band The Lightning Bolts.